Construction of the Foreshore South from the Goodwill Bridge to behind 1 William Street is progressing well with the river-based piling close to completion. Positioned along the Mangrove Walk between the Goodwill Bridge and QUT ferry terminal, the Boathouse Pavilion is starting to take shape. Precast concrete sections have been installed on the pavilion piles and in the coming months the remainder of the structure will be built. Multiplex Project Manager, Tyson Macdonald said, “The use of precast concrete allows us to minimise activities on the river and have a greater control over the quality of the product. With piling nearly complete, marine equipment on the river will reduce from three barges down to two. Although the piling will soon conclude, the level of activity on the river will continue with large precast sections of concrete – sometimes weighing as much as 57 tonnes, being floated up the river on transport barges. Mangrove pruning to build the Mangrove Walk has been carried out under a controlled process overseen by an arborist, and within an environmental management plan that was approved by Economic Development Queensland. The mangrove trees have been pruned, but not removed. As per the development’s management plan, a rejuvenation and replanting program of additional mangroves in the area will be undertaken. 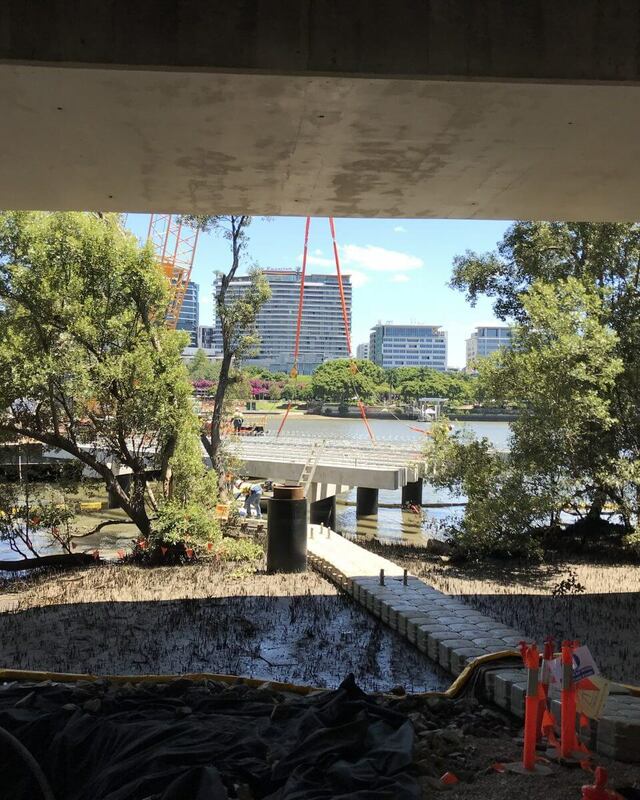 Construction of the Mangrove Walk has required some changes to river operations and the consortium is extremely grateful to the community for their patience and understanding. On the river’s edge, work is continuing with new stormwater infrastructure. Two bio-retention basins will be located within the new Waterline Park to treat stormwater from across the Queen’s Wharf Brisbane development. Destination Brisbane Consortium Project Director Simon Crooks said all current marine and foreshore works are on track to be completed in the second half of 2019. “Delivery of the Foreshore South is a great outcome for the people of Brisbane. It will provide increased high-quality public amenity with areas to sit, walk, run, or cycle along. It will also revitalise a tired and underutilised part of our inner city and provide a new recreational area for inner-city residents, works and visitors,” he said. The Foreshore South project will deliver the first stage of public space upgrades including widening the bikeway to a 3-metre segregated cyclist path and a 2-metre pedestrian path from the Goodwill Bridge to behind 1 William Street. This will be complemented by an above-water Mangrove Walk, and new outdoor recreation areas at Waterline Park behind 1 William Street.